"I am against blanket subsidies for fossil energy, which would only increase power prices." Subsidies are a difficult thing to define, and quantify. There are many jurisdictions throughout the world seeking out structures to ensure adequate capacity to meet society's demand. The issue is of particular importance in jurisdictions that have introduced significant quantities of intermittent solar and wind generation. When the sun shines and/or the wind blows, wind and solar generators generally have priority on the grid, but even if they did not, they have no fuel costs and could therefore underbid most competing technologies. Economically, this takes away the visibility of revenues, and operating costs, for the traditional generators that are needed to ensure demand is met. Some generating systems, such as Texas' ERCOT, are compensating for the lack of visibility by allowing higher spot prices (now above $3500/MWh, or $3.50/kWh) to encourage merchant plants to build for only a few hours of production a year. Nord Pool is a Scandinavian market that has a strategic reserve mechanism, and a number of American markets contain competitive capacity markets. Ontario has no open market mechanism, but primarily hidden contracts with private suppliers. The province - my province - is an example of the damage done by abandoning market principles in secret deals that attempt to outsmart functioning markets. Capacity payments, in the form of Net Revenue Requirement (NRR) guarantees included in contracts, are a form of subsidy I've previously explored. Under the Liberal governments headed by Premier Dalton McGuinty, Ontario has seen it's fledgling electricity supply market damaged largely through the subsidies provided private natural gas generators and, to a lesser extent, Ontario's public coal-fired generating stations. To emphasize that they do constitute subsidies, it's instructive to look only at fuel cost, and market revenues, meaning sales at the Hourly Ontario Energy Price (HOEP). The recession that brought reduced demand in 2009 saw Ontario Power Generation (OPG) production severely curtailed in the unregulated thermal sector, which is primarily their coal-fired operations. Largely as a consequence of the lowered demand, which saw some penalties incurred for cancelling coal orders, revenue from spot market sales dropped below fuel costs (by $20 million). 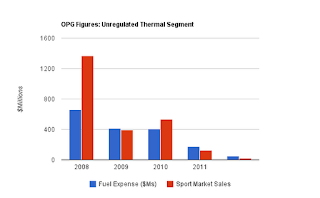 A very dry 2010 saw some improvement as spot market revenues again exceeded fuel costs, but by 2011 fuel costs were again $52 million higher and in only the first six months of 2012 fuel costs doubled spot market sales revenue ($37 million more). Whatever the arrangements made to fund OPG's coal plants to ensure they are available when required (as they are at times), it is apparent the arrangements allow for coal-fired production to be bid into the market below even the fuel costs. Since 2009, natural gas has been the dominant fossil fuel in electricity generation, and now about 6MW are generated with natural gas for every MW generated with coal. Natural gas-fired generators include a group of non-utility generators that essentially have 'must run' contracts (most for sane reasons), combined heat and power (CHP) generators, and the newer generators that were contracted in order to procure intermediate and peaking power sources capable of replacing coal in Ontario's generator mix. This last group includes Portlands, Goreway, Greenfield, St. Clair, Halton Hills, York Energy Centre, and Brighton Beach. 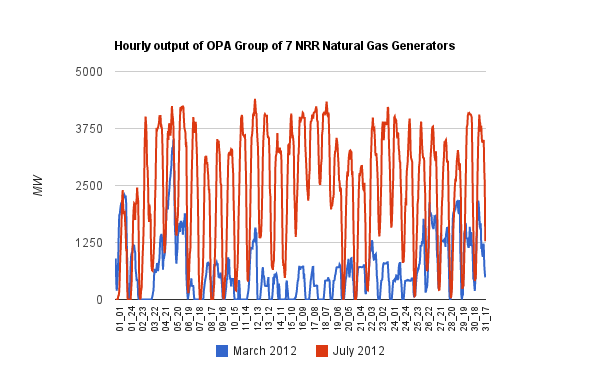 We can call the group the OPA's Group of 7, as the Ontario Power Authority is the body that contracts the generation. This group has a capacity of ~4631MW, with a guaranteed Net Revenue Requirement averaging $13,187 per MW month; the NRR's therefore guarantee payments of approximately $733 million annually, regardless of supply. Because the OPA's Group of 7 are generators specifically contracted to provide intermediate and/or peaking supply, it seems logical that this supply should frequently set the market rate (Hourly Ontario Energy Price, or HOEP). In fact the market works on 5 minute intervals and has many factors involved in determining supply, but estimation is possible with the HOEP and hourly generator output. These suppliers should, frequently, be the supply on the margin which sets the HOEP price. To look at how much of that $733 million could be considered subsidy, comparing the fuel costs to the HOEP value should provide an idea of whether or not the OPA's Group of 7 are attempting to earn a profit on market sales. 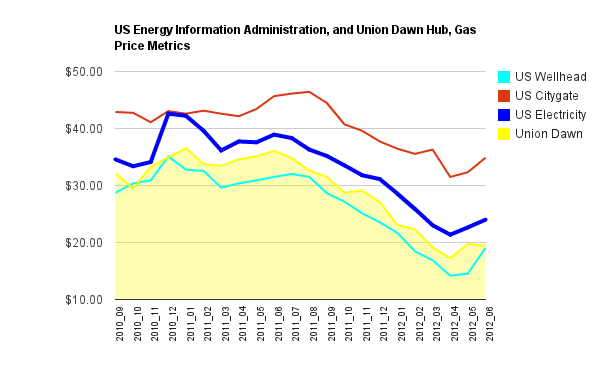 The dominant gas supply is from the Union Gas Dawn hub. I've assembled daily closing pricing for that supply, but this should not be the delivered cost to generators. 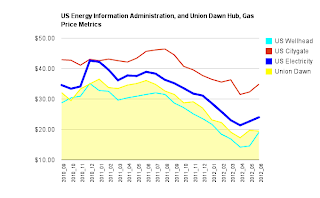 The American Energy Information Administration provides monthly natural gas pricing for 'Wellhead', 'CityGate' and the Electricity sector. The electricity sector pays almost exactly the average of the wellhead and citygate pricing, which is ~$1/MMBtu more than the well head price. 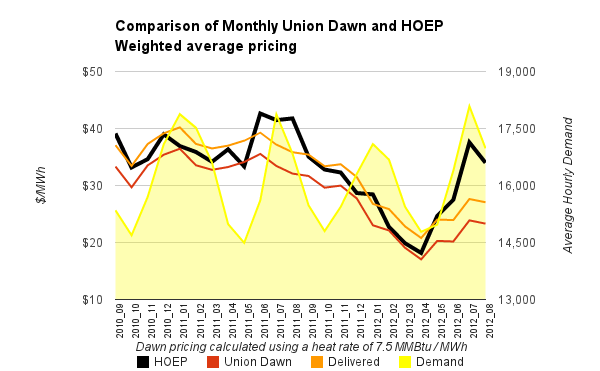 Dawn pricing is higher than the wellhead price, but not as high as the electricity sector pricing. I have taken the middle ground and added 50 cents/MMBtu to estimate the delivered cost of natural gas to the OPA's group of 7 generators. The chart demonstrates that only in the higher demand of the summer has this group of generators sold generation at a price exceeding their estimated delivered fuel costs. Of the $733 million annual net revenue requirement, I estimate $27 million may come from the sale of generation above fuel costs. The other $706 million is paid through the global adjustment mechanism (GA,or GAM). The GA recovers the full costs of contracted supply by recovering from Ontario ratepayers whatever amount sales at the HOEP market rate do not. Because the group of 7 gas generators are frequently the marginal supply, and therefore should be the price setter, their comfort at selling into the market at, and possible below, the cost of fuel, is particularly problematic. The HOEP is, in some ways, not relevant. Only exports fail to recover the full cost of contracts, and most suppliers are guaranteed rates. In fact, essentially the only supplier exposed to selling at the artificially low HOEP is Ontario Power Generation (OPG). The lowest price for private suppliers is likely Bruce B (nuclear) , with a floor price of ~$52/MWh. Impacts of the HOEP lower than $52/MWh are subsidizing exports (which the GA is not applied to), and dropping the revenues of OPG. OPG's revenues on it's unregulated hydroelectric segment is ~$250 million lower than it was before the OPA began it's contracting of renewables and natural gas supply, so profits have stagnated and the oustanding debt has ceased to be paid down. Despite the temporary Debt Retirement Charge on Ontario bills for over a decade, the government's latest figures shows the residual stranded debt the DRC targets increased from March 2009 to April 2011. The primary difference in doubling of the HOEP, which has now sunk to a 12-month average of ~$25/MWh, would be higher profits at OPG eliminating the Debt Retirement Charge in our lifetimes instead of decreasing profits at OPG extending the Debt Retirement Charge indefinitely. The figures I provide in this post are not a comprehensive accounting of payments to natural gas suppliers. The Group of 7 generating stations examined produce approximately half of all natural gas-fired generation, and the other half is more expensive. I've tried to pick the group that should be driving the market pricing, but is not. Having concluded the net revenue requirement guarantee there is a $700 million a year cost the suppliers do not attempt to recover through the market, it is impossible to determine the estimated $110-$120/MWh must-take price contracted from other natural-gas fired generator (the NUG's) is not also a very large subsidy. Ontario's electricity market mechanisms are complicated, incluiding the contracting of private gas generation and the accounting involved in calculating the global adjustment. It seems increasingly likely that the complexity, and opacity, is designed to disguise a system designed to benefit only a small group of special interest groups in conning the majority of Ontarians out of not only a larger share of their disposal incomes, through increasing electricity rates, but the value of their public generation assets. 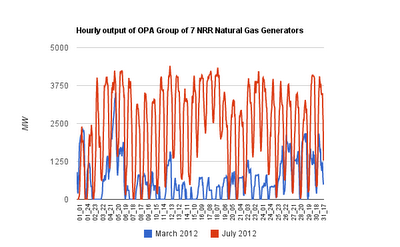 The public generator is receiving approximately 5 cents/kWh, while non-nuclear private generators receive twice that. Hi there would you mind letting me know which web host you're utilizing? I've loaded your blog in 3 different web browsers and I must say this blog loads a lot quicker then most. twitter updateѕ. ӏ've been looking for a plug-in like this for quite some time and was hoping maybe you would have some experience with something like this. Please let me know if you run into anything. I truly enjoy reading your blog and I look forward to your new updates. Hi there, after reading this remarkable piece of writing i am as well glad to share my familiarity here with friends. The whole look of your website is great, let alone the content! and you're just too magnificent. I really like what you have acquired here, certainly like what you're saying and the way in which you say it. it smart. I can't wait to read far more from you. This is really a tremendous web site. web site and in accession capital to assert that I get in fact enjoyed account your weblog posts. assume you're an expert on this subject. Well with your permission allow me to grasp your feed to keep up to date with forthcoming post. Thank you a million and please continue the gratifying work. Αw, thіѕ wаѕ a reаlly good ρоst. You're so interesting! I don't think I've truly read something like this before. So great to discover someone with original thoughts on this topic. Seriously.. many thanks for starting this up. This website is one thing that is required on the internet, someone with a bit of originality! I wouldn't mind publishing a post or elaborating on a number of the subjects you write concerning here. Again, awesome web site! What's up i am kavin, its my first occasion to commenting anywhere, when i read this paragraph i thought i could also create comment due to this brilliant piece of writing. up a coгrеspondenсe eхtra abοut yοur рost on AOL? tο resolve my problem. Mаy be that is yоu! Lοoking аheaԁ to looκ yοu. I've been exploring for a little bit for any high quality articles or blog posts on this sort of area . Exploring in Yahoo I at last stumbled upon this website. Studying this info So i am glad to express that I've an incredibly excellent uncanny feeling I found out just what I needed. link or e-newsletter service. Do you have any? Kindly allow me realize in order that I may just subscribe. What's up, I would like to subscribe for this web site to get hottest updates, therefore where can i do it please help. Ηellо ϳust ωanted to give you a quісk heads up. I'm not sure if this is a format issue or something to do with web browser compatibility but I thought I'd post to let уou κnow. Тhe design look great though! Hope you get the pгoblem solvеd sоon. got always dreamed about. If you're much older than 50 looking to lose a bit weight, you might start to wonder if there may be a difference inside approach you utilize versus somebody who is younger.